Rogue One centers around our female heroine Jyn Erso (Felicity Jones), a criminal who has been recently recruited by the Rebellion. Jyn is valuable to the rebellion because of her father, Galen Erso (Mads Mikkelsen), is a scientist responsible for helping the Empire engineer its deadliest weapon yet, the Deathstar. The last known contact from Galen was a message sent to one of Jyn’s other father figures Saw Gerrera (Forest Whitaker). Jyn teams up with Cassian Endor (Diego Luna) one of the Rebellion’s most loyal fighters to track down Saw with hopes of finding out where to location Galen. From then on the two embark on an exciting journey to help bring down the empire’s Deathstar plans. 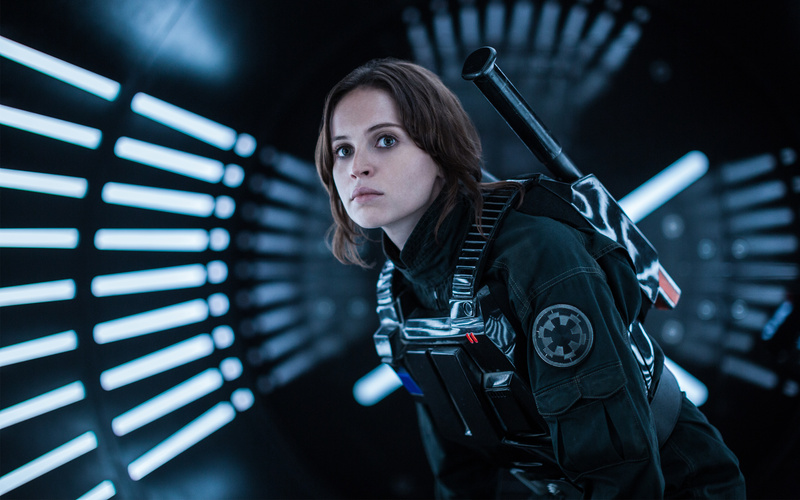 Felicity Jones does the franchise well with its newest female heroine since last year’s Star Wars: The Force Awakens. I enjoyed Felicity a bit more than newcomer Daisy Ridley because her character was rougher around the edges in this film and she brought more attitude to her character. Outside of Felicity Jones, there is another star of the film and he is not human. My favorite character of the film was none other than K-2SO (Alan Tudyk). K-2SO is a former Empire drone that has been reprogrammed to help the Rebellion. He is a strategist and truly says whatever comes to his mind which leads to a few laughs in the film. The voice work that Alan Tudyk does is nothing short of amazing and I truly enjoyed his character in this film. Overall, this movie is amazing and I enjoyed every minute of it. It may be hard to invest in some of the characters since there are so many with little backstory and plot development to truly commit to but that doesn’t take too much away from the film. If you have to compare Rogue One to The Force Awakens this prequel prevails as the winner. Rogue One goes there with darkness and action which was lacking from The Force Awakens. Star Wars fans will definitely be amazed at the imagery of the film and the action it delivers from beginning to end. I definitely would recommend you PAY to see this film in theaters. Rogue One: A Star Wars Story hits theaters everywhere this Friday, December 16th. This movie will sell out so be sure to head to Fandango and purchase your tickets now! Have you seen Rogue One: A Star Wars Story? Share your thoughts on the film below!